"Not until the late 1960’s did paisleys return to their former glory in the fashion world. The new attraction to exotic musical and artistic influences catapulted them back into the boutiques, magazines and adorned the hippest pop icons of the day, most noticeably The Beatles, The Rolling Stones, The Jimi Hendrix Experience, The Kinks, The Who and The Small Faces. Carnaby Street was the place to shop for the latest paisley fashions. It is a very long article but the relevant part starts at the 9th paragraph down (titled "The Big Comeback") and basically describes how a fashion designer from Glasgow, known as The King of Carnaby Street became one of the leaders of the fashion movement called 'The Peacock Revolution', which was a "flamboyant, vivid, menswear fashion trend that enabled men to wear bold patterns including flashy spirited paisley prints". At the time, he dressed rock stars in his 15 different boutiques on Carnaby Street. The Beatles in 1968 then began to regularly visit India and embrace its philosophy, music and of course paisley fabrics. The paisley design was commonly associated with 'rebellion'; it was a 'statement of non-conformity', and the perfect print for the 'androgynous hedonistic counterculture' of the hippies. "Paisley patterns and other fabrics from around the world helped encourage a spirit of multiculturalism and, for the wearer, were visual statements of this principle." In addition to the above, the most interesting part explains that in 1982, a new psychedelic genre developed, called "the Paisley Underground" and how this neo-psychedelic movement included the bands: The Bangles, The Dream Syndicate, Green on Red, The Long Ryders and The Three O'Clock to name a few. 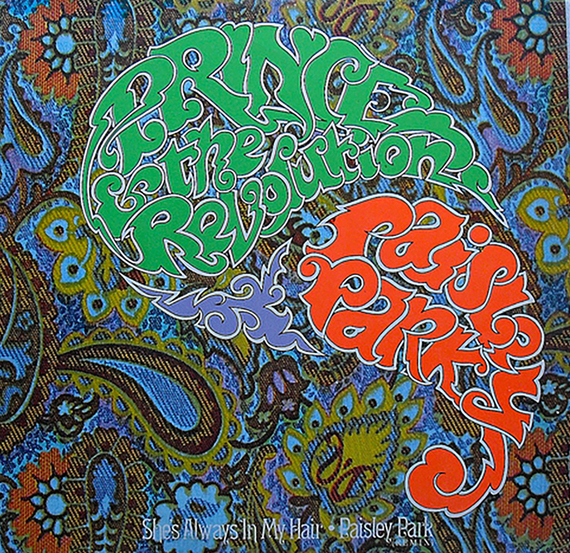 This is apparently the movement which inspired Prince to bring forward a strong psychedelic sound on his 1985 album 'Around the World in a Day' and to name his record label and recording studios accordingly, thus making the paisley pattern his trademark from then on. Two years later, he was writing 'Manic Monday' for the Bangles, and signing the Three O'Clock to Paisley Park Records.